Very nice :) Didnt like my pictures tho? I wanted to ask you also, is it possible to have the same format I have already, but just change the picture? Is there an easy way I can do that on my own? WOW!!! i really like your templates!!! i use them all the time! Keep up the good work! i love this beach template! it's one of your best! the background pic is someplace in malaysia rite??? I love your templates, thanks so much for sharing them with everyone! I just loaded the beach template and really like it, however everytime I click on an individual post or archives it goes back to the old blogger template I was using previously. Can you tell my how to fix this? The only thing I changed with the template was the links, but it did the same thing before I added links. Thanks again for all your time, effort, and talents. Ok, it was a blogger problem. I emailed them and they fixed it. Thought I would let you know. Thanks again for the great templates! Is it possible to correct? Thank you. Thank you very much for your help. Now one sees correctly in IE, Firefox, Opera, Mozilla, Safari, etc. Hey, I really love this template and would like to use it. But I would like to make the blog name at least 5x bigger. How can I do that? Hi dude, I had downloaded de seaside template but it seem dont works on my blog... Can kindly tel me what goes wrong? Izzt I must do a post then I can see de seaside blog? How to make the sidebar wider? I'm not so good in this "blogging problem", but so far I can do all as your clue. Only want to have a wider sidebar for the profile and wider body for the text. I love this! I am using it but could you help me locate the title in the html code? I'd like to make it bigger. Thanks! I found your template refreshing so dlded it and tried to put it in my blog but blogger does not seem to be accepting it because of bad tagging format. the thing is, i downloaded the "splash" template and i have followed all ur instructions, but when i preview my blog, the back ground color does change, but the design "the header" etc doesnt show up at all! could u please help me out? are u gonna put up some new stuff soon? This code worked but the background picture wont show up. any idea why? 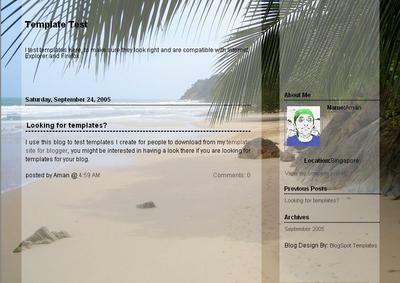 Hi, I really love the beach template but it it not compatible with the new blogger . would it be possible to adapt the template for the new blogger ? I haven't tried to change anything, just copied and pasted the text! Help? i'll try to my blog.. I can't install this template. I don't know what I did wrong. I put all the text as it came at the .txt archive, but nothing happened. How do I post the beach foto? How do I put the titles? Do I need to put some html codes? I will appreciate very much the help! Hello, please help me where to buy the background image. I want to use in my personal project. Thank you. Mine does not seem to be aligned as you have it. The side nav bar About Me is more so in the middle. How can I adjust this? thanks for the beautiful template but i have the same probleem of gemini i have 2 seem like picture of my first page. This is beautiful, but everything is scrunched over to the left side. How do I fix?